This is my 2nd order from you guys and I really love your candles. The candles burn nicely with scent all the way through. I highly recommend you to all my friends and family. I do plan on placing MANY future orders through you. I bought some magnolia votives and a few other things to try out. I was so blown away with the quality I received. Mind you, I have 2 favorite stores I shop at for candles, etc and I'll tell you that this company far exceeds them. 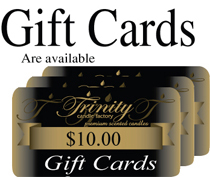 Trinity has made me a permanent customer. The magnolia and Jasmine votives are so pleasant to burn any time. I'm starting to learn how to use the oils and with the droppers, it makes it so easy. 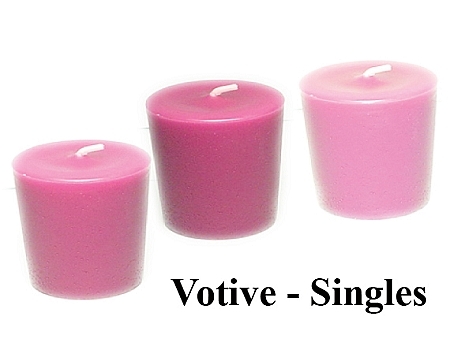 I love these votive candles, such a great price! You can try so many fragrances without making a big commitment to any one candle, and discover new favorites! Also, I find the most fun way to have a party - inside or outside - is to have scads of votives - and different fragances - it makes such a festive atmosphere! Great to fill out a gift basket, too. Received the Jasmine candles and couldn't be more happy with them. The first scented candles I've purchased that actually provide a wonderful scent. Will purchase again soon. these candle are a wonderful size. Fits inside all of my candles that have ferns and flowers on them. I have already ordered more. I love these small candles as I have been able to try different scents. Right now during allergy season, we are using them less but I love all the scents I purchased. They burn so nicely.